Rodents make up almost half of the world’s mammals, and are one of the most familiar types of pests worldwide. Rodents are animals belonging to the animal order Rodentia, and have the defining characteristic of front teeth or incisors that grow constantly and must be kept short via the practice of gnawing. Animals that fall within the rodent category include familiar creatures such as mice, rats, chipmunks, squirrels, and beavers, as well as less familiar creatures including chinchillas, capybaras, marmots and porcupines. Mice and rats are the most common rodent pests, and the ones that are also most likely to carry disease and destroy your property. Babies – Common rodents such as rats and mice usually make their nests in warm, compact, out-of-the-way locations where they are safe from both harsh weather and predator interference using shredded materials such as wood, fabric, grass or paper. Their babies are small, pink and relatively hairless when first born, and will squeak continuously. Juveniles – As rodents develop, their fur grows out and they become more mobile. How long their juvenile stage lasts depends on the type of rodent, but in mice and rats, roughly 5-9 weeks elapse between the juvenile stage and sexual maturity. Mature Animals – Mature rodents are highly mobile and generally adept at running, climbing, jumping and even swimming. All rodents chew constantly in order to shorten their constantly lengthening incisors, and will shred materials in order to line and insulate their nests. They do not necessarily eat wood or fabric, but they may chew on wires, boxes, and your photo album if inside of your home. Rodents will eat everything from seeds, nuts and bugs to fruits, vegetables, eggs and meat, though some have special preferences. 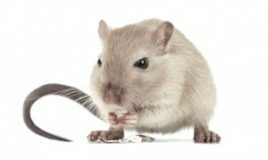 Predictably, one of the first things you will notice if you have rodents in your home is the visual evidence or sounds of chewing. You are also likely to notice their droppings, usually dark and pellet-shaped, and may see stains along the edges of the walls where rodents tend to be most active (wild rodents are often fairly dirty animals). To get rid of rodents, the best thing to do is to seal off their access to food and water to the extent possible. Be careful about taking out the trash and storing it away from the house, and try to cover any pet food while pets are not eating it. Cleaning up spills, vacuuming, washing dishes and putting leftovers away will help you keep your rodent problem under control and dissuade new rodents from taking up residence on your property.